For the landorm in Turkey, see Cape Anamur. 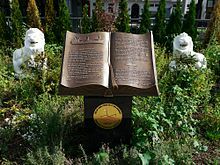 A memorial in Hamburg, the city from which the Cap Anamur sailed, erected by the rescued Vietnamese refugees expressing their gratitude in German, English, and Vietnamese. In 1979, amidst the rising number of Vietnamese boat people fleeing Vietnam in unseaworthy crafts, Christel and Rupert Neudeck, together with a group of friends, formed the committee "A ship for Vietnam" to rescue the refugees. For the rescue mission the group chartered the freighter Cap Anamur, named after the French name of Cape Anamur, a cape on the Turkish Mediterranean coast near the city of Anamur that marks the southernmost point of Anatolia. The journeys of Cap Anamur (and her sister ships afterwards) were – against the predictions of many pundits – a huge success: 10,375 boat people were rescued on the open sea and an additional 35,000 were medically treated. ^ The Associated Press (2016-05-31). "German NGO Cap Anamur Founder Rupert Neudeck Dies at 77". The New York Times. ISSN 0362-4331. Retrieved 2016-06-01.